This is not going to be one of my typical reviews. It is going to be more of a Style Discussion but I will highlight one beer in particular during this discussion. There is a real need to talk a little about these biers. So many times I’ve seen YouTube’rs and other reviewers get caught off guard when trying one of these beers for the first time. They see a brand name and that it’s got an A rating on BeerAdvocate.com so they want to try it, only to find out that Lambics are a different animal in the beer kingdom. Technically they are beers; they are brewed with malts, yeast and hops but mostly fruit tasting. They are more like a highly carbonated wine cooler than a beer. And they are extremely tart and sweet, not a malty beer sweetness but more like a candy sugar syrupy sweetness. I should also mention that I am discussing the Fruit Lambics. There are other styles of lambics that are sour Belgian style ales that don’t have the fruit in them. A Lambic is a spontaneously fermented Ale. They do not pitch the yeast like modern brewers. It is an open fermenting tank that allows the natural yeast to blow in and ferment the bier. The traditional Lambic is a sour/tart ale. Some Lambics are blended of old and young brews called gueuze. I’ll post a separate discussion on gueuze when I review some of them. Ok back to Fruit Lambics. These biers are aged lambics then when the fruit is added a second fermentation takes place and they are aged again. The final result is an amazingly fruity ale. I must admit that these biers are really too sweet for me. I do occasionally enjoy them but usually in small quantities as a dessert bier or as an aperitif before a dinner to wake up the taste buds. Here are some names of typical Fruit Lambics and the fruit that is in them. I think the best of the fruit lambics is the Framboise. 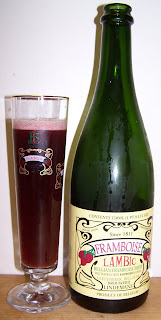 The Framboise is the Lambic Ale make with Raspberries. It also seems to be the most versatile of the lambics. I have had several of these Framboise Lambics and Lindemans is the one I like best so far. Because of the sweetness I find that the straight up Fruit Lambic drinkers are usually women. Most guys take a sip or two and enjoy it but that’s about it. But it is usually the ladies that really like it and can’t believe that it’s a beer. As a matter of fact I usually bring a bottle of Lindemans Framboise to a dinner party and it goes over pretty well; again mostly with the ladies. It’s an easy way to get someone’s attention about the world of Belgian Biers. As always it’s not for everyone but it is usually an interesting ice breaker at a party. Yes, I did mention versatility earlier. My favorite use for a lambic especially the Framboise is as a topper. I pour it over a berry fruit cup and even over ice cream. Yeah, that’s right I pour beer over ice cream. That is how sweet this bier is. We served a Framboise Fruit Cup over vanilla ice cream at our Belgian Bier Event for dessert. It was really good. Just about anywhere that you would use raspberry syrup you can use Lindemans Framboise. 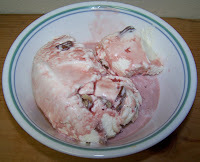 Tonight I poured it over my favorite Butter Pecan ice cream. Last night we had family over for a birthday party and I talked three guests into Framboise over ice cream and they all loved it. Although I have not tried it yet I have always suspected that it would also make a great Ice Cream Float. So if you are looking for something different or want to make and impression at your next dinner party try a Fruit Lambic Ale like Lindemans Framboise.